What a pleasure it was to again hear pianist Daniel Pesca perform my work, Inner Truth, in Chicago. Daniel premiered the work in June at PianoForte Chicago, recorded it in August at Oberlin, and this performance took place as part of his faculty recital at the University of Chicago. It was clear from the start that the music was now thoroughly in his fingers, as well as his heart, and it was a thrill to hear him play again. The program was a modified version of what he performed in June, with works by Carter, Knussen, Rands, Takemitsu, and Thomas. This varied cast of characters was presented with natural drama and wit. Bravo, indeed! While in Chicago there was time to enjoy some of the city, including the glorious Art Institute. I’ve been before, but it was time for a refresher, and I was again impressed with this cultural monument. The two highlights from what I got to see on this visit were Calder’s Streetcar, a mobile which occasionally produces a soft clang when a small rubber tip randomly strikes a brass disk (a possible inspiration for future work? 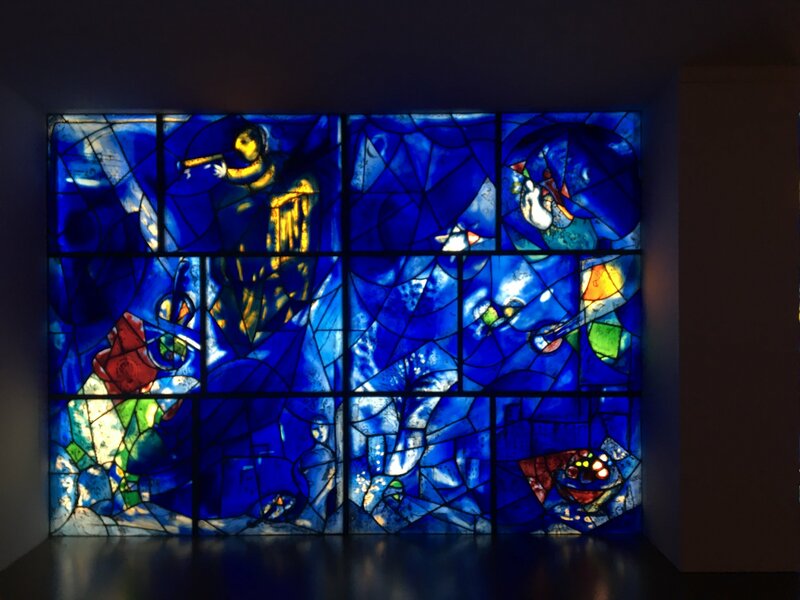 ), and Chagall’s America Windows, a glorious blend of colors and light which draws us closer toward its warm, vibrant hues. This piece alone would have been worth the trip to Chicago, but this combined with hearing music and seeing some old friends made it all the better.